(1979), activist, dramatist, researcher, participant and initiator of actions in the areas of political and social theatre, community theatre and engaged art. He has collaborated with the Łaźnia Nowa Theater (Nowa Huta, in Kraków), the Workcenter of Jerzy Grotowski and Thomas Richards (Pontedera, Italy), with the German collective Rimini Protokoll, and with artists Artur Żmijewski, Paweł Althamer and Katarzyna Górna. In cooperation with directors Wojtek Klemm, Bartosz Szydłowski and Agnieszką Olsten, he has staged performances based on plays by authors including Bertold Brecht, Heiner Müller, Sławomir Mrożek and Olga Tokarczuk. Author of Zwrot polityczny [Political Turn] (2009), editor of Culture and Development: Beyond Neoliberal Reason (2017), co-editor of the collections Jerzy Grotowski – Teksty zebrane [Jerzy Grotowski: Collected Papers] (2012), Built the City: Perspectives on Commons and Culture (2015), Kultura i rozwój. Analizy, rekomendacje, studia przypadków [Culture and Development: Analysis, recommendations, case studies] (2016). A member of the Political Critique team, of the European Alternatives board of trustees, an activist in the trade union Workers' Initiative and in the DiEM25 political movement. Since 2013, with Jaśmina Wójcik and others, he has been conducting social and artistic actions in post-industrial spaces of the Warsaw district of Ursus. Action: Place à l'art, 2014 edition, Marseille, photo by Les Têtes de l’art. Source: politicalcritique.org. The text begins with an observation that in the area of theatre and performing arts there can be witnessed a retreat from participatory practices, a weariness of participation, and even a negation of participatory attitudes. The author attempts to defend the ‘participation paradigm’ and argues that the deepening of participatory practices can only take place through a transformation of the ‘production apparatus’ of culture, that is, through stepping beyond participation towards collective governance of cultural organizations by artists and communities. By analysing the case of the Italian Teatro Valle Occupato and the French Les Têtes de l’Art the author shows how collective governance of cultural organizations contributes to a deepening of participatory art practices. The author argues with or draws support from such figures as Claire Bishop, Markus Miessen, Chantal Mouffe, Antonio Negri, Walter Benjamin and Ugo Mattei. In recent years, the participatory approach in cultural practices including visual and performative arts, as well as theatre, has taken a central place in discussions as a set of instruments corresponding to the need for giving communities agency and voice, building social bonds, the democratization of culture, understood as its propagation and democratization through art. Even more recently, however, a turn in this approach to participation has become noticeable. An increasing number of voices point to a crisis in participatory practices, and ask how we can break out of the paradigm of culture centred on the category of participation. How do we go beyond participation? The most common response to this crisis is a reflex to withdraw the participatory component and resort to more vertical work constellations and structures in an artistic event, along with returning the focus to aesthetic experience at the expense of social and political impact. The theoretic foundation for this current was laid by two books: Markus Miessen’s The Nightmare of Participation (2010),1 which purports to give ground to this latter approach, termed ‘art after participation’, and Claire Bishop’s Artificial Hells: Participatory Art and the Politics of Spectatorship (2012),2 which outlines the reasoning behind the latter. Both books share a certain penchant for the progressive vision of society and a belief that the emancipation process is closer to gaining discursive, cultural and institutional hegemony for the progressive side in a field accessible to antagonists of various mindsets (as the positive figure mentioned in both books, Chantal Mouffe, would say) than it is to reaching social autonomy, independent of the state and capital, through creating collective good, disregarding the public vs. private divide in the process of self-production of differentiated multiplicity (per Antonio Negri, a negative figure appearing in both books). The authority of Miessen and Bishop opened up a space where we can finally speak openly about participation, uncover its shortcomings, offer more criticism, and finally openly say what many of us have only suspected. As a social activist, I fully understand the emotions Pobłocki has in mind towards participation, and with my experience of practicing participatory art, I can imagine walking in Siwiak’s shoes. I am, however, against a complete retreat from the realm of participation. I am convinced that the participation paradigm emerged from a genuine need for transforming culture and the desire to change society in directions of agency, building community bonds and democratization. I believe we’ve not gone far enough to back out of this arena. Conversely, the general climate of utilising harder forms to exert social influence in Poland and Europe calls for intensifying efforts for participation. How do we do it? To answer this question, let me refer back to theoretical writings mentioned earlier. Miessen approaches the participatory method with, I must say, a harsh bluntness. ‘Participation […] no longer works’, he states in ‘Waking Up from the Nightmare of Participation’, written with Hannes Grassegger,5 and explains: ‘In the participation process there are often too many potential deciders. There is however never enough people who accept responsibility and risks, people who have the courage to turn these decisions into actions and push things forward’.6 Meanwhile, to illustrate dilemmas involved in the participatory approach, Miessen offers such intricate examples as, ‘If there are only idiots in the room, they will vote for an idiotic government.’7 To be brief, the solution he offers is to rebuild the structure and place greater emphasis on individuals who shoulder responsibilities, decisions and agency. Bishop adopts a far more subtle analytic approach, to the point of attempting to rescue the participatory paradigm, and even to elevate participation. To that end, she proposes a departure from the sociological approach to artistic events of a participatory nature and instead affirms that: ‘It is also crucial to discuss, analyse and compare this work critically as art, since this is the institutional field in which it is endorsed and disseminated, even while the category of art remains a persistent exclusion in debates about such projects’.8 Bishop makes repeated use of Jacques Rancière’s classic proposal that equates aesthetics and politics then postulates discussing participatory practices – without considering their potential social, ethical and political connotations – as ‘an autonomous regime of experience that is not reductible to logic, reason or morality’.9 Thus Artificial Hells emerges as a pivotal historical and theoretical treatise that gives rise to a new framework of participatory approach as a lasting category of artistic practice, rooted in the field of art and in existence since the beginning of the twentieth century. One more remark, Bishop notes that it is to Rancière that we owe the creation of ‘new artistic terminology by which to discuss and analyse spectatorship, until that point somewhat schizophrenically governed by the critical untouchability of Walter Benjamin (The Work of Art and Author as Producer) and a hostility to consumer spectacle (as theorized by Debord)’.10 Bishop appeals for 'desacralization’ of Benjamin and Debord, as leading figures in preventing thinking about participatory practices from gaining aesthetic momentum. Let’s keep this appeal in mind, particularly as it relates to Benjamin, who will re-emerge later in this discussion. So, while Miessen preaches a return to vertical and personalized practices, Bishop advances a cognitive transformation: reclaiming the participation paradigm by fortifying it with aesthetics analysis. Nevertheless, in both cases, going beyond participation appears to transport us into the past. Zmyślony: Artificial Hells was published on the Polish market [...] over three years after the English version. Taking into account political changes that occurred in the meantime, do you not find that the book might have become a little obsolete? What I mean is mainly the Occupy movement. I should make one more remark for the characteristics of both positions to be complete. I consider the philosophical conflict between Chantal Mouffe and Antonio Negri largely representative of the antagonism between the centre of European thought, represented by Mouffe, and its periphery, represented by Negri. Similarly, Miessen and Bishop, preaching departure from participation, represent the core of Anglophone and Germanophone cultural centre in opposition to the periphery that practically and analytically (like Castells) stands in defence of the participation paradigm. Polish culture (including the mainstream of theatre culture which displays clear signs of growing fatigue with participation, which renders it an ideal field for analyses) appears to gravitate towards the cultural and social position of the centre, while any push towards a more participatory paradigm can only come from the periphery. I will return to this theme later in the discussion. Teatro Valle is the oldest active theatre in the capital of Italy. Located in the city centre, it was built in 1726. Initially an opera stage, in the twentieth century it was adapted to serve as a public theatre. In 2011, it was decided that the theatre would be dissolved and the historic building sold. It was to be transformed into an exclusive restaurant. On 14 June 2011, the building was taken over by a several dozen people, members of the cultural community and social activists. They argued that culture is common good and, as such, belongs to everybody. Within a couple of hours, hundreds of Romans flocked to the building in Via de Teatro Valle. A meeting was held during which it was agreed that the theatre would become public property and be transformed into the Teatro Valle Occupato cultural centre. From that moment on (August 2014), the new public-benefit institution was managed by a collective divided into commissions, work groups and a general assembly that held the mandate to make final strategic, operational and programme decisions through a direct vote. Press coneference at Teatro Valle, 2011. Source: teatrovalleoccupato.it. The example of Teatro Valle Occupato is viewed as proof that it is possible for a culture institution to operate along democratic principles. Interestingly, the organizational effort towards collective governance of the para-institution in this case did not translate into collective, participatory, empowering artistic practice – theatre practice – that would satisfy the democratic ambitions of the collective managing the centre. This fact causes the experiment to be criticised. In the end, the social energy that fuelled the initiative was exhausted and members of the collective, harassed by the police, decided to surrender the building. How can the flash of Teatro Valle Occupato be used to protect, preserve and strengthen the paradigm of participation in culture and through culture? 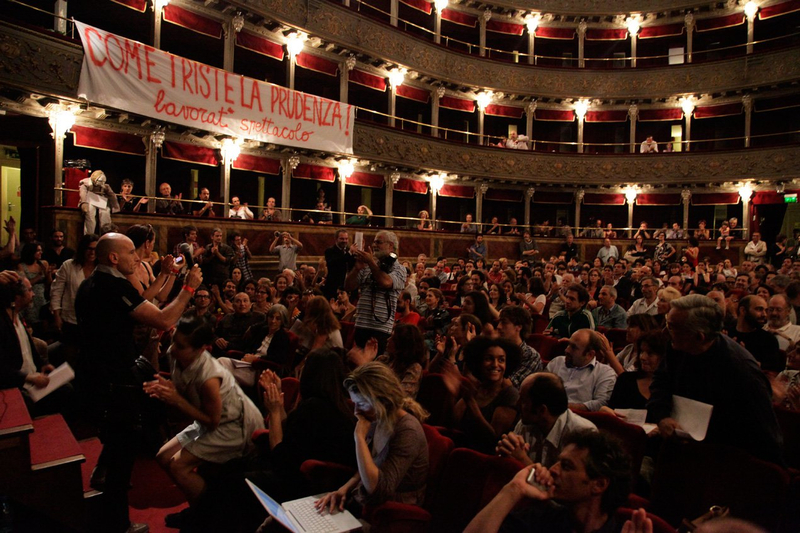 The lasting legacy of the three-year operations of Teatro Valle Occupato is not artistic practice that would be of use to the participation cause, but a legal entity with its direct democratic procedures of managing a cultural institution as the common good, for the benefit of all and for future generations. Let’s return briefly to Bishop’s criticism of Walter Benjamin’s diagnosis in Artificial Hells. Benjamin’s essay ‘The Author as Producer’ criticised by Bishop, was written in 1934 and referred to the relationship between aesthetics and socio-political involvement of literature. Among its many themes, one particularly resonates with the example of Teatro Valle Occupato: Benjamin’s claim, inspired by Brecht, stating that an artist aiming at exerting social influence can not ‘supply the production apparatus without changing it’.16 The ‘production apparatus’ in question is that of art, its material, organizational and governance parameters. The prudence of the Teatro Valle Occupato collective striving to transform the foundations of artistic production sprang from their awareness of the fact that a key barrier to the development of collective, participatory and empowering artistic practices is the lack of a proper ‘production apparatus’ at their disposal. Transforming this was seen as the most urgent priority, and that intuition reached far beyond the developments in Teatro Valle Occupato. The ‘production apparatus’ of art is what captured the attention of Bishop, seeking the means to overcome the ‘slight disappointment’ expressed in Artificial Hells. Her next work, Radical Museology (2014),17 analyses cultural institutions the author qualified as progressive: Van Abbemuseum in Eindhoven, Museo Reina Sofía in Madrid and MSUM in Lubljana. The highest obstacle on the path to sustaining the paradigm of participation, strengthening participation, developing practices and instruments of empowerment and developing community bonds in culture and through culture is culture’s ‘production apparatus’ that hasn’t adapted to the participatory approach as a cultural practice. By ‘production apparatus’, I mean the artist whom Agata Siwiak would like to release from the obligation to ‘give voice to society’ then place once again in the position of the one who determines ‘clear rules of engagement’. An artist endowed with the attributes of Miessen’s individual who ‘accepts responsibility and risk, [has] the courage to turn these decisions into actions and push things forward’ – all the more so when there are only idiots in the room. Thus, by ‘production apparatus’, I mean hierarchical structure in the teams realizing cultural events, for example, in the theatre domain where participation in collective work from a position other than that of a director is taking part in a ‘great sham’18 (as the inflation of confidence in participation was presented by Kacper Pobłocki’s Miessen preface, mentioned above), with the main creator’s unquestioned position as supreme authority in the process of creation. This means hierarchy within organizations that operate in the field of culture and cultural institutions, bodies that are limited by the legal environment that prevents them from taking their practice beyond participation to collective decision-making, and forces them to react by forgoing participatory ambitions and returning to more vertical work constellations. Legal barriers also come from the economic environment that generates the necessity to join the exchange of material resources while failing to account for non-material ones, including agency, social bonds, cooperation skills and practices. For a change to occur in the approach to participation, for the drive for participatory culture to be sustained, we need to make use of competencies developed under the paradigm of culture revolving around the category of participation to affect change in culture’s ‘production apparatus’. We need to fine-tune its material, structural and administrative parameters, build instruments for collective decision-making and lay the foundation for continued development of the participatory paradigm, then in a longer perspective, to practice this new culture of participation imbued with new competencies in a new production environment. Going beyond participation does not take us to vertical structures or aesthetics but to collective agency: self-government and self-determination, collective decision-making. How do we achieve it all? The topic of transforming the foundations for creating culture is not a new one in Poland. Particularly in recent years, it has become one of the main themes of discussions about culture. Proponents of a progressive vision of society usually adopt perspectives inspired by the diagnosis of Chantal Mouffe. They assume that the field of culture is an arena of dispute over values, crowded with adversaries, individual and collective, social movements, organizations and institutions. To achieve any emancipation, we need to gain discursive, cultural and institutional hegemony then use it for the common good. Hence a tendency adopt an institution-oriented approach, placing cultural institutions in the centre of the dispute and concentrating on the question of whether public cultural institutions, hierarchical and non-participatory as they are, are capable of having a positive impact on participation. While I consider these questions very important and take part in such discussions, I believe that it is not cultural institutions that will drive progress for the participatory paradigm. The change of ‘production apparatus’ will occur in the autonomous social arena, independent of public institutions and market mechanisms, through the creation of common good in a process of self-production of differentiated multiplicity that is participatory and democratic throughout. What does this mean in practice? Phillippe Eynaud is a lecturer at the Sorbonne, renown for his skill at presenting various economic perspectives. His principal focus is relations between forms of governance and quality of democracy. He is author and co-author of publications including Civil Society, the Third Sector and Social Enterprise: Governance and Democracy.21 Eynaud decided to accompany Les Têtes de l’Art through the transformation process as a researcher and advisor. The transformation lasted from 2008 to 2013, resulting in Les Têtes de l’Art assuming the form of an association operating on the cooperative model. Its general assembly (over a hundred and twenty members) was divided into specialised committees, the board of directors was augmented by collective bodies of artists cooperating with the organisation, donors and recipients (members of local communities) and permanent employees and collaborators employed by the organisation. The outcome of the reform was the development of deliberative competencies and management skills that allowed the formulation of a new proposal of artistic practice. 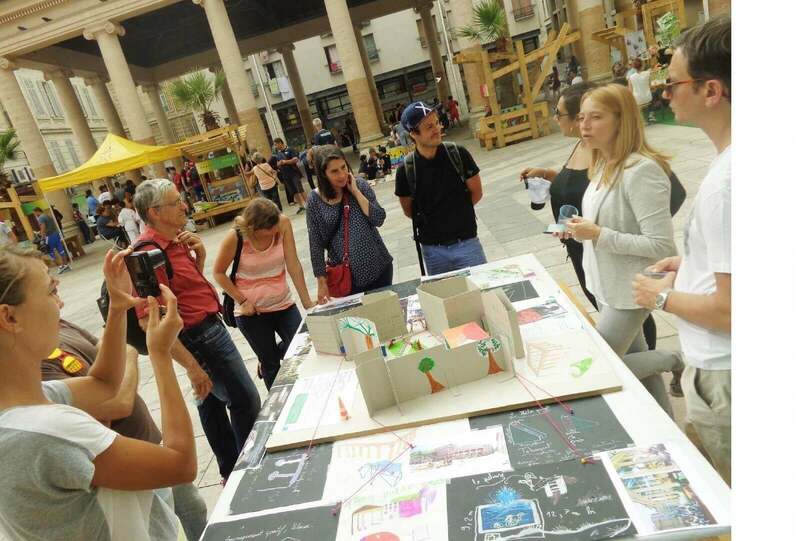 In 2015, Les Têtes de l’Art launched the programme Place à l’Art, based on the methodology of prototyping small-scale urban architecture in collaboration with its intended users. Les Têtes de l’Art people joined the ‘production apparatus’ of participatory culture, transforming it into a participatory-production apparatus. This gave them new competencies in participatory decision-making, which in turn led to the restitution of participatory cultural practice, enhancing techniques geared towards empowerment and community-building founded on the independence of recipients who become final decision-makers on the direction, shape and course of their artistic practice. This is the recipe for going ‘beyond participation’. Quoting this article’s title at this point is not accidental. Indeed, it was inspired by the experiences of Les Têtes de l’Art. The phrase ‘go beyond participation’ has been the motto of Marseille artists since the organisation embarked on their structural reform. Participatory decision-making practices can be developed through the transformation of culture’s ‘production apparatus’, through measures towards collective governance of the organisational and material foundations of working in culture and through culture. Participatory art, as remarked by Khebizi and Eynaud, is a domain we can turn to for models for developing participatory governance skills. There is a link between the experience of participatory art and building organisations in which all members take part in decision-making. I am therefore convinced that, rather than in gaining discursive, cultural and institutional hegemony, the essence of emancipatory practice lies in building organisations for the common good by autonomous entities, independent of the public vs. private divide, in the social sphere, on the periphery of the grand forces of state and capital. Such organisations – participatory ‘production apparatuses’ of participatory art ̶ shall become a strong foundation for developing further participatory cultural practices whose recipients will have a say in formulating the message and the creative process, and in determining their functions. I also believe this work should run parallel to an accompanying ‘formalisation process’. Let me use the example of Les Têtes de l’Art to explain this category. I understand ‘formalisation process’ as ‘collective creation of law’. The Marseille organisation’s reform, much like the emergence of direct-democracy practices at Teatro Valle Occupato, involved a contract, observed by all participants of the transformation process, that regulated the association’s democratic structure. It was reflected in the organisation’s new charter, very similar to that of the Rome arts foundation. Like the occupants of the theatre, the founders of Les Têtes de l’Art were not legally required to make any formal changes to reach their collective-governance objectives. They did so, I believe, because they wanted relations between collective members to be clearly defined, specified and legalised through collective-governance practices. I believe that this approach should be a model to all who create organisations for the common good. I also think that it’s a barrier that might prove insurmountable for numerous public cultural institutions. The laws they need to comply with are owned by the state, while we’re the owners of the law that we will accept as binding. Before recapitulating, I need to make a methodological note. Polish readers might assume that the examples of Teatro Valle Occupato and Les Têtes de l’Art are too distant from our local context, making conclusions drawn from the analyses of these examples inapplicable to the Polish, Central and Eastern European contexts. This couldn’t be further from the truth. I carefully chose examples directly relevant to our circumstances. Representatives of Teatro Valle Occupato made two visits to Poland and cooperated with Polish culture activists. In 2012, they worked in Lublin and their efforts contributed to the founding of the Autonomiczne Centrum Społeczne Cicha 4 centre that operated for a year as a democratic para-institution in a building in the city centre. In 2013, they visited Warsaw, invited by the Institute of Advanced Study. They met with employees of the Centre for Contemporary Art at Ujazdowski Castle, who were struggling to democratize that institution. Les Têtes de l’Art have continued cultural and intellectual cooperation and exchange with the circles of the journal and publishing house Krytyka Polityczna [Political Critique]and the organisation’s creators and activists, such as Ugo Mattei, have kept in touch with the Polish local scene. The examples discussed here are indeed translatable to the Polish and, more broadly, a Central European context, and they live in our specific disputes and struggles towards culture grounded in participation. Duniec’s essay appears to be biased, since when discussing participatory practices, she offers only examples of theatre-makers who, if I may say so, ‘transitioned to participation’ from traditional stage practice. These are playwright Jolanta Janiczak and directors Wiktor Rubin, Jan Klata and Michał Borczuch. Meanwhile, the most impressive achievements in the realm of participatory practices have appeared on the periphery of mainstream culture, including theatre culture. While I wouldn’t want to detract from the efforts of the artists listed by Duniec, I do believe that the political value of ‘participatory theatre’ should be assessed on the basis of experiences of people who have worked with communities, gained experience in communal theatre, cultural animation, rehabilitation, therapy through art and, last but not least, theatre education. Strengthening the paradigm of participation is also more likely to be shouldered by representatives of the above domains, rather than those of leading Polish theatre directors or mainstream representatives in other artistic fields. We can only hope that art criticism will expand its perceptive horizons with phenomena from outside the institutional mainstream and its surroundings. Only then will critics and commentators have the chance to resist and shake off that reflex to withdraw from participatory ambitions. There is art beyond participation. Art that’s even more participatory. The text was commissioned by the Zbigniew Raszewski Theatre Institute and delivered at the conference ‘Pedagogy of Theatre. Directions, Reflections, Perspectives’, which took place on 5-6 November 2016 in Warsaw. Translation into English was commissioned by the Institute of Advanced Study in Warsaw run by Krytyka Polityczna. 1. Markus Miessen, Nightmare of Participation (Crossbench Praxis as a Mode of Criticality), (New York, Berlin: Sternberg Press, 2010). 2. Claire Bishop, Artificial Hells: Participatory Art and the Politics of Spectatorship (London, New York: Verso, 2012). 3. Kacper Pobłocki, ‘Prawo do odpowiedzialności’, preface to the Polish translation of Markus Miessen, Koszmar partycypacji, trans. Michał Choptiany, (Warsaw: Fundacja Nowej Kultury Bęc Zmiana, 2016), p. 70. 4. Agata Adamiecka-Sitek, Elżbieta Depta, et al, ‘Between Encounter and Change of Reality, between Participation and Emancipation: In Conversation about Challenges Facing Social Theatre’ Polish Theatre Journal 2, 2016. 5. Markus Miessen and Hannes Grassegger, “Waking Up from the Nightmare of Participation”, Markus Miessen, Nightmare of Participation (Crossbench Praxis as a Mode of Criticality), trans. M. Choptiany (Warszawa: Fundacja Nowej Kultury Bęc Zmiana, 2016), p. 10. 6. Miessen, Nightmare of Participation, p. 308. 8. Bishop, Arificial Hells, p. 13. 11. Iwo Zmyślony ‘Lekkie rozczarowanie. Rozmowa z Claire Bishop’, Dwutygodnik.com, 2, 2016. http://bit.ly/1RDUCwR [accessed on 22 November 2016]. 12. Manuel Castells, Networks of Outrage and Hope: Social Movements in the Internet Age (Cambridge, Malden: Polity Press, 2015), p. 255. 13. Slavoj Žižek, The Year of Dreaming Dangerously (London, New York: Verso, 2012). 14. On the occupation of Teatro Valle, see Igor Stokfiszewski, ‘Teatro Valle – przyszłość jest dziś’, Krytyka Polityczna, 29 Marh 2012. http://bit.ly/2dT24to [accessed on 22 November 2016]. 15. Fritjof Carpa, Ugo Mattei, The Ecology of Law: Toward a Legal System in Tune with Nature and Community (Oakland: Berrett-Koehler, 2015), p. 157. 16. Walter Benjamin, The Author as Producer, trans. Anna Bostock, (London, New York: Verso, 1998), p. 93. 17. Claire Bishop, Radical Museology: Or What's Contemporary in Museums of Contemporary Art? (Köln: Walther König, 2014). 18. Pobłocki, ‘Prawo do odpowiedzialności’, p. 70. 19. Philippe Eynaud, Sam Khebizi, ‘Participatory Art as a Vector of Innovative Governance: Reflexivity at the Heart of the Formalisation Process’, in Build the City: Perspectives on Commons and Culture, eds. Charles Beckett, Lore Gablier, et al, (Amsterdam, Warsaw: The European Cultural Foundation, Krytyka Polityczna, 2015), pp. 279–294. 20. Eynaud and Khebizi, ‘Participatory Art’, p. 284. 21. Civil Society, the Third Sector and Social Enterprise: Governance and Democracy, eds. Jean-Louis Laville, Dennis Young, Phillipe Eynaud (London: Routledge, 2015). 22. Agata Adamiecka-Sitek, Elżbieta Depta, et al, ‘Between Encounter and Change of Reality, between Participation and Emancipation: In Conversation about Challenges Facing Social Theatre’ Polish Theatre Journal 2, 2016. 23. Krystyna Duniec, ‘O polityczności teatru’, Dwutygodnik.com, Jan. 2015. http://bit.ly/2ebAmXy [accessed on 22 November 2016].